If your baby is teething and you haven’t got one of these……you need to buy one now, they are amazing! Bo & Bel create a fabulous range of teething jewellery that is fashionable and stylish, and with a huge range of colours and styles there is one to go with every outfit – for the fashion conscious they have even featured in Harper’s Bazaar. Have a look at their website you will be amazed by how many different styles and colours are available. My little one has been teething for what feels like forever, she has certainly been teething most of her life. I was so keen to get my hands on Bo & Bel jewellery so that I could offer her something to chew on throughout the day, instead of chewing on whatever she could find, often the remote control, shoes etc…Babies always want to chew on something that isn’t theirs, and Bo & Bel have hit the nail on the head by developing teething jewellery which is ours but also theirs. 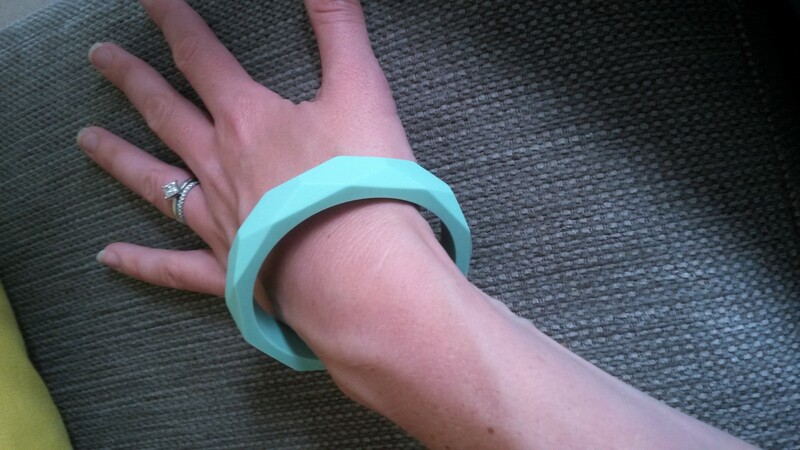 I chose the Amy Geometric Necklace and Mint Teething Bangle. 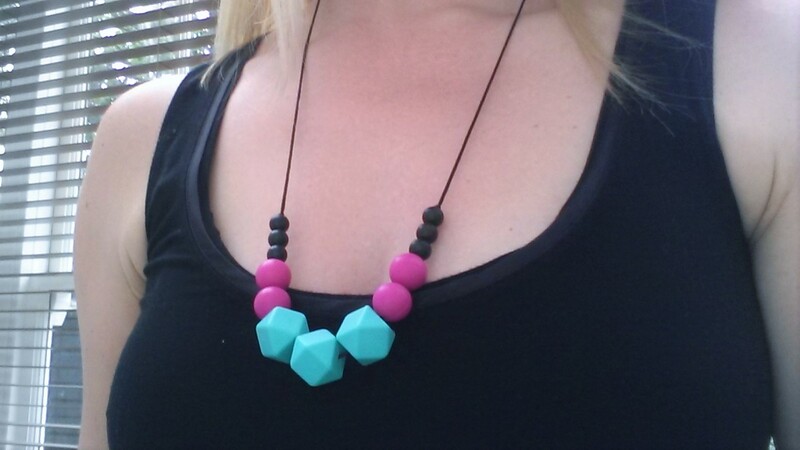 The necklace is gorgeous with Turquoise, Bright Pink and Black beads, I love the bright colours which go with a lot of my clothes as well as adding a splash of colour for Summer. My little one is also really taken with the colours, they are really eye-catching and help to catch her attention. Bo & Bel also offer Quadrant, Round and Rectangular beaded necklaces too. 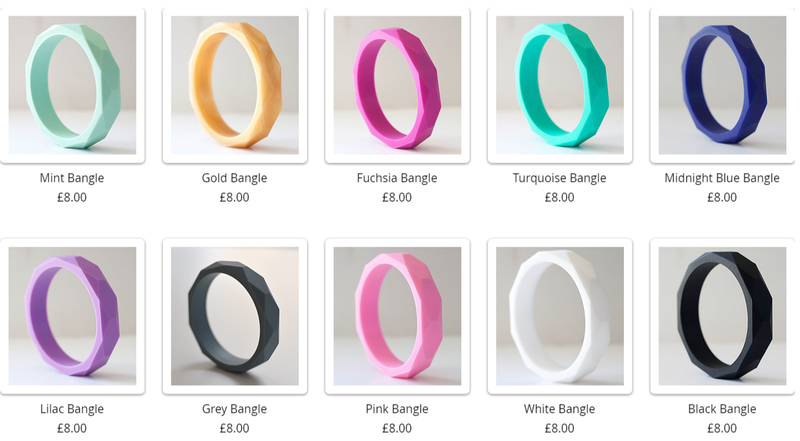 The Teething Bangle is fab too, my little one loves to chew this one and play with it as a toy, she has been known to fall asleep with it in her mouth. I love the wide range of colours available, there is honestly a necklace and a bracelet to match every outfit, season, event, and they can be worn casually or for the more formal occasion. 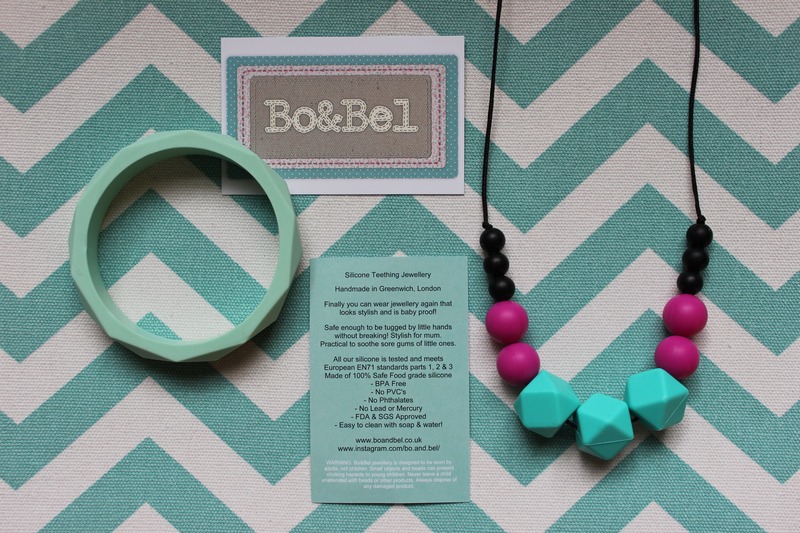 So why is Bo & Bel’s jewellery perfect for teething. The beads and bangles are made from 100% food grade silicone with no BPA’s, PVC’s, phthlates and are lead free. In other words they are firm but rubbery which is why our babies love teething on it, and more importantly safe for them to chew on. They are super easy to clean too, especially removing dried on Weetabix. The necklace is a perfect length at 14″ and has a handy safe release just in case your little one tugs on it too hard. Not only is the jewellery a teething necessity, they are also excellent for breastfeeding too, providing your baby something to play with whilst breastfeeding, helping to lengthen the breastfeeding session, as well as improving their hand-eye coordination. I love my Bo & Bel Necklace and Bangle, every Mum with a teething baby should have one, not only are they are stylish, they are also very practical helping your little one to relieve their teething pains and also giving them something to play with. 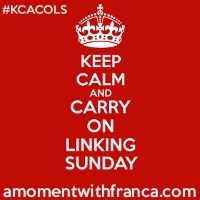 I would recommend the necklaces and bracelets to all Mums. The lovely people at Bo & Bel also offer a gift wrapping service making this an ideal present for a first time Mum with a newborn baby, or a Mum who is currently in the midst of teething. Bo & Bel are everywhere, you can find them on their website, on Twitter, on Facebook, on Instagram, on Pinterest and on LinkedIn. I love looking at pictures of their jewellery on Instagram and Pinterest seeing it being worn, and to helping me to decide on my colour and style choice. 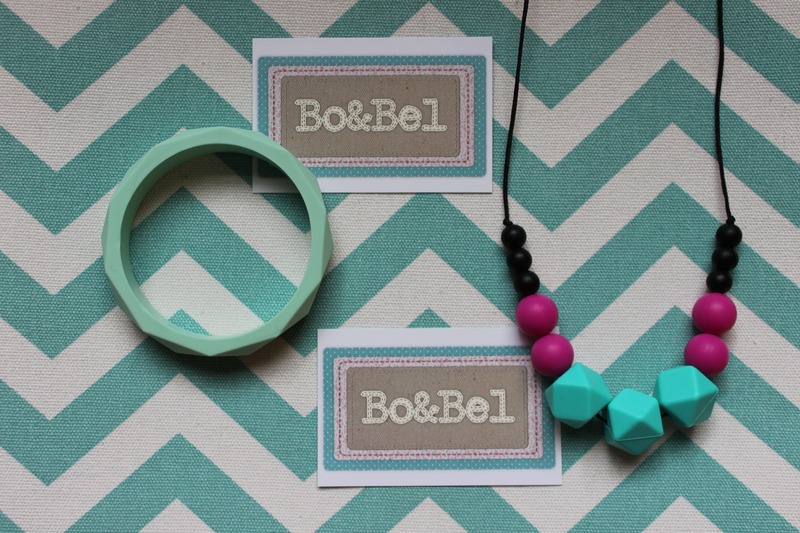 I hope you have enjoyed reading my review of Bo & Bel jewellery. This product was gifted to me in order to be reviewed. All thoughts and opinions are my own. Wow these look great I had never heard of them before. I love the mint coloured ones you have, what a great idea for teething babies. These look great, my eldest is always trying to grab my jewellery. If I had one some of these pieces I wouldn’t have to keep stopping her! These look fab, I wish they were around when my kids were that age. We just had the little toys you could get and good old bongela lol. These look great! My little boy has been teething forever and still has no actual teeth, something like this might stop him gnawing on my hands! Oooh, I’ve heard great things about these!! I absolutely love that they look so fashionable, and can be coordinated with your outfit!! That, along with them serving such a great purpose as being safe and soothing a baby’s need to chew, makes them pretty perfect!! 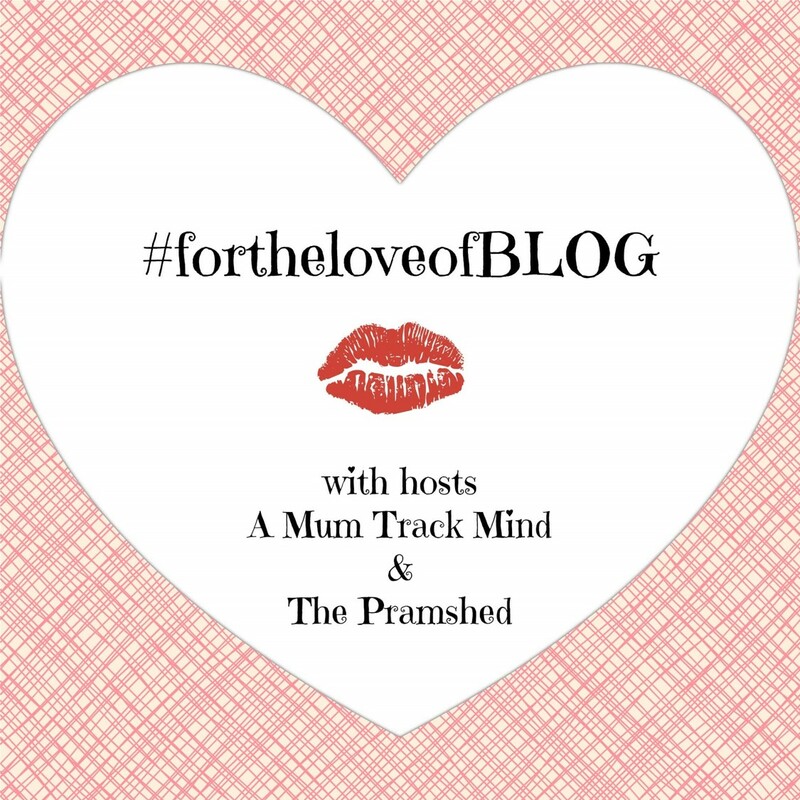 My children are through this stage now, but I will certainly keep these in mind as a lovely gift for a new mum, or as a recommendation to anyone I know having teething troubles! !